The usage of mobile devices has risen significantly in recent years due to all the advantages in mobile technology happening everyday. However, because the technology comes in close contact with healthcare workers and patients, it leaves patients susceptible to infection. 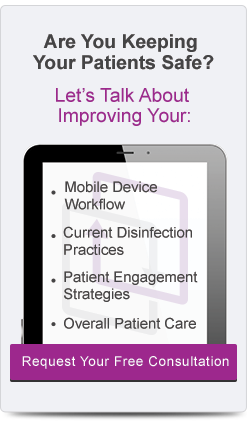 Below, we bring you 4 articles that prove mobile disinfection needs to be implemented into daily routines in healthcare facilities. Researchers in this study examined doctors, nurses, and other health care personnel and took samples from their hand and mobile phone to test for the identification of microorganism and antibiotic sensitivity. Are We Aware How Contaminated Our Mobile Phones With Nosocomial Pathogens? This study remains exclusive to Operating Rooms and Intensive Care Units where the goal was to determine the contamination rate on 200 healthcare workers' hands and mobile devices. 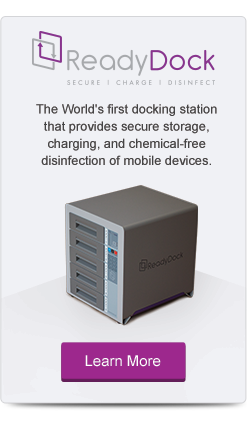 It concluded that the use of mobile devices could be the source of healthcare associated infections. In this article researchers Rawia Ibrahim Badr, Hatem ibrahim Badr, Nabil Mansour Ali study the hands of neurosurgeons, anesthetists, and nurses before and after they came in direct contact with a cell phone to see the growth bacterial infection on their hands left from the device. This study was conducted at the Post-Operative Pediatric Intensive Care Unit (POPICU) of Children's Hospital in Ain Shams University in Cairo, Egypt. Researchers studied the rate of bacteria on healthcare workers' mobile phones and compared it to those of the patient visitors. David Engelhardt, Founder and President of ReadyDock, though some people call him our "Mobile Device Disinfection Specialist.” He has over 28 years of experience in software and hardware solutions development in healthcare and manufacturing, with a particular focus on mobile technologies. David is passionate and committed to providing safe and workflow-efficient methods to enable clinicians and patients to enhance care through the use of innovative technologies. In the small window of time when he is not working or spending time with his amazing wife and daughter, he can be found playing USTA tennis, collecting vinyl records, and shaping music and sound in his recording studio.